For no apparent reason, I decided to take a different route home from work a few weeks ago, and on the way back I discovered a card shop. The LCS itself wasn't a complete surprise: I'd heard a couple regular customers discussing at the flea market this past summer. But I didn't realize it was so close to where I worked -- I nearly crashed my car into a pole after seeing it sandwiched between the bland exteriors of a CVS and a hardware store. Nor, of course, could I have known that it'd have something I've never, ever seen at a local card shop: a 15/$1 box! Indeed, one of the first things I saw upon entering the shop was the very 15/$1 box you see at the top of this post. Though it included a mix of all sports, the vast majority of it was baseball. A good amount of the stuff in there was your expected late '80s/early '90s fare, but it was far from the Topps and UD stuff I've seen hundreds of times. There was a fair amount of semi-major brand cardboard (Triple Play, Score, etc.) to keep things interesting, and my collection has enough gaps from that era to make those boxes a whole lot of fun. So there I was in heaven barely thirty seconds in the place. And did I mention the oddballs? Amidst the small handful of Conlons in those 15/$1 box came this odd Lefty O'Doul, which has the exact same front as his '92 Conlon card but features an ad for a Frisco restaurant named in his honor on the back. With a little digging, I found two uncut '87 Topps panels sitting at the bottom of the 15/$1 box (Henderson/Rice on one, Sutton/Winfield on the other) -- and I got to cut them out! But for my money, this was the biggest of the 15/$1 surprises: a Bo Jackson rookie! I've actually been searching for a relatively cheap copy of this very card for a while -- it's one of the last semi-big Bo cards I needed, and one that went for a pretty penny back in the day, from what I've heard. Me, I'll take it for six cents, thank you very much. 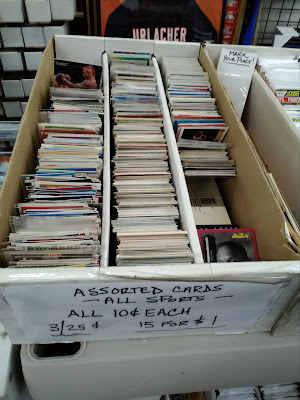 Now, 15/$1 boxes aside, there's one small drawback to this store: basically everything for sale is behind the counter, which means I had to ask the shop owner every time I wanted to see something. Of course, I like to have stuff out in front of me to dig through at my will. But overall the shop owner was a great guy (we discussed his massive White Sox collection) and didn't make me feel like I was inconveniencing him by asking for the many boxes I ended up looking through. And talk about inventory: they had 28 different boxes labeled MISC. ODDBALL behind the counter. Twenty-eight! I only got through maybe a half-dozen of the oddball boxes, and the prices were quite reasonable: these four set me back all of 50 cents a piece. By luck, one of the boxes I picked had Hostess inside, and I tracked down a longtime need of mine with that Lenny Randle (also 50 cents!). Beckett doesn't list the Randle -- one of his few Met cards -- as a short-print or anything of that nature, but I'm a bit skeptical: I've never seen one in-hand before this LCS trip and they've rarely popped up on the internet. ...and went back the very next week, because can you blame me? I didn't get a picture of the shop, but I'll just say their inventory is way larger than anything I've ever seen anywhere, card shop or otherwise. I don't think I'd be exaggerating too much by saying they have close to a million cards lining the wall from just about any set you can think of. This included three large boxes of Pacific, probably the one brand I have the most trouble finding these days. Naturally, I decided to start with Pacific and go from there. Within minutes, I'd found the hallowed '93 Pacific Dale Murphy, the only card of him as a Rockie I still needed (as far as I know) and one that'd been sitting on my Dime Box Dozen list for over two years(!). I'm having a difficult time describing how awesome it was digging through three long boxes of Nothing But Pacific: I mean, I get excited when I find one random Pacific card in a dime box. While Dale Murphy as a Rockie stands above all, I scoped out a bunch of other splendid Short Term Stops I needed, like Ozzie Guillen as a Brave(?!) and Shawon Dunston as a Cardinal(?!?!?!?!?!). Pacific mini-collection hits that fell into the black hole of the late '90s/early-aughts. It's sometimes a pain to collect dudes who played around the millennium era since many of their cards seem forever unattainable. Thankfully, I don't have to worry about these four anymore. Somehow, after that Pacific whirl, I still had enough energy to dig through more boxes(! ), so I sampled a few boxes I spotted behind the counter labeled MISC. CUBS. I'd like to note one thing about this LCS which isn't exactly a common feature of most LCSes: the prices are fair. I've often overpaid for cards from shops in the past, thinking: oh, those are just card shop prices. But the price tags at this place were just plain fair, LCS or otherwise. The Pacifics averaged out to about a quarter per, and these tough Cubs oddities were mere 50-centers, which good luck finding '70s TCMA oddballs like that Lazzeri and Bresnahan at prices like that. 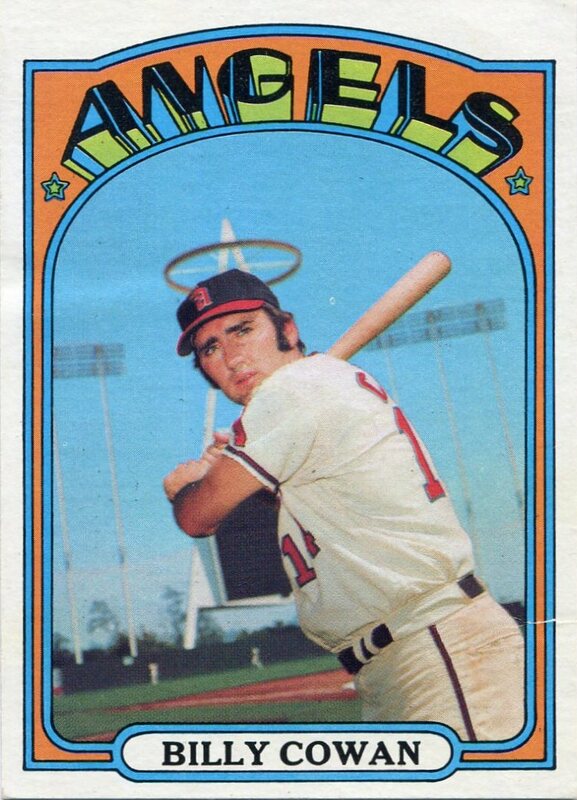 These oddballs of more modern-day dudes were all of a quarter a pop, and that includes my very first Topps TV single with the Zimmer there. But as if the aforementioned Dale Murphy wasn't enough, I nabbed another white whale of mine during my return trip to the shop with this '83 Thorn Apple Valley Joe Carter. Like the Murphy, it's another bigtime Short Term Stop: Carter played in all of 23 games with the '83 Cubs before being dealt to Cleveland. 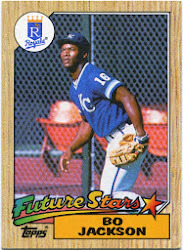 And as far as I can tell, this -- a stadium giveaway, I believe -- is the only card apart from Carter's 1984 Donruss rookie to feature him as a Cub (and not to mention this one has a far superior ivy shot!). This isn't something you see in the wild too often -- most of the sets are hoarded by collectors since it also features a rookie card of some dude named Ryne Sandberg. But even though the five dollars I spent on the Carter skyrocketed over the price of anything else I bought from the LCS that evening, you better believe it was worth it. To think that two longtime needs of mine were sitting at a card shop mere minutes away all this time is both glorious and painful -- although now I'm worried I might start dropping entire paychecks at this place. Sounds like a shop I'd love to visit. Nice pickups. I see 2 Tigers I can add to my niche collections list. Interleague, nice! 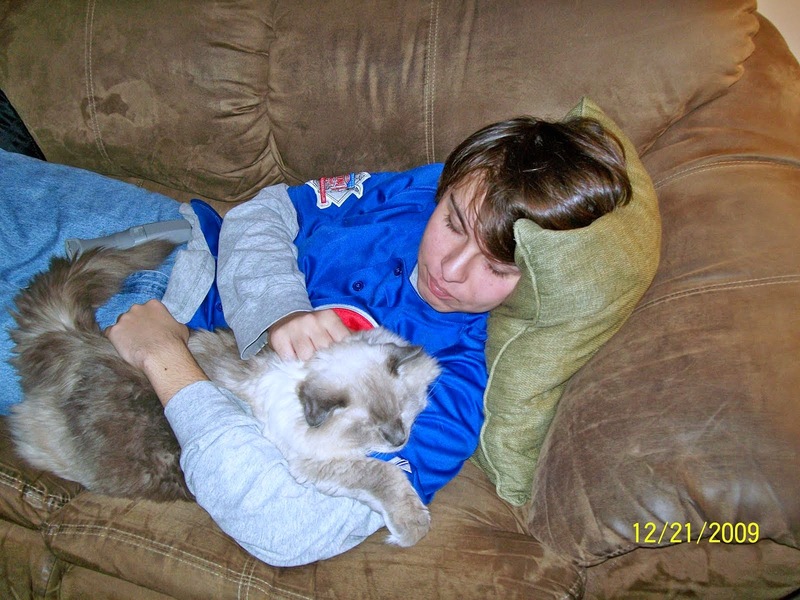 The Ausmus with a Cubs cameo and the Nomo with Ivy in the background. One of these days I'm going to have to scour the Pacific and Pinnacle checklists. Looking forward to checking this place out with you sometime! This post along with a few others must be a sign. A sign that it's time for me to start picking up some 90's Pacific baseball card sets. Their photography is really awesome. P.S. Congratulations on finding the Bo rookie in that box! Bo Jackson rookie, Hostess, Pacific Prisms... sounds like this is the place to be! Wow, great shop. Reminds me of one I found recently with a lot of single stock, but they don't have Pacifics like that! PS Anyone need '94 Pacific? I have a big box of extras! Wow. That place is sweet! Nice grabs! Sounds like my kind of place! keeping the place a secret? i could spend a full day going thru all those boxes! I'm pretty jealous. I don't really have a local card shop with good dime boxes and other random stuff. The worst part is I live in a big city and their isn't one card shop within city limits. Glad you finally found that Murphy. Usually I can help if you need a Rockie, but I don't have a darn thing from '93 Pacific in my own collection.